1/4 C. Turbinado "Sugar in the Raw"
Mix meat cure ingredients to dissolve and pour in bag with thawed rack of spare ribs then massage. For vivid red color do not rinse the ribs...it comes from the meat cure reacting with the residual blood. The fresher the meat the more the red. Let ribs stand for exactly 4 hours. Preheat Oven 250F and place foil over baking sheet and set cooking rack on pan. Take cured ribs out of bag and place on rack. I do not rinse mine. You do not have to remove the membrane from the back of the ribs. Rub 1/2 the rub seasoning on the meat then brush on the tomato sauce stirred with hot sauce to make a wet rub directly on the meat...just smear it around with a brush. You might not need all of this sauce. Pour 1 C. Water or any tasty liquid in the pan and cover pan of ribs with heavy duty foil not touching the ribs. Bake for 1 hour at 250F. Bake for 2 hours at 275F. Bake for 30 minutes at 350F. You can stop here and finish tomorrow if necessary. Light the grill with charcoal and hickory and place ribs on grill off center from the charcoal and smoke with hot dry smoke for 30 minutes. Sauce the ribs if desired with your favorite sauce and close the lid to smother the remaining charcoals. Keep warm for up to an hour but don't let it burn. If you want crunchy sweet "Barked Ribs" as shown in the picture instead of wet sauced ribs...then mix the Barked Spices and spread it all over the ribs 15 minutes before they are finished...spritz with the apple juice..and heat through to toast the sugar. Use remaining unused seasoning to garnish Ribs, Cole's Slaw, French Fries, Mac 'n Cheese ect, or pour it into the remaining tomato sauce and attack a few burgers with it. Do not put TenderQuick powder on dry..always dissolve it...and do not exceed the measured amount listed. Scalloped Potatoes ~ Microwave Quick! A premade rub will be fine as long as its not too sweet or too salty and could cost about the same. I use water or broth in the meat cure but its also good with cola, root beer, or Dr. Pepper, beer, wine ect. It should not be sweeter than orange juice. Just remember that sweet ingredients can burn quickly and unexpectedly. Most people that make good spare ribs put the sweet ingredients on at the end of the cooking procedure to avoid burning the sugar, except in Kansas City where burnt sugar is considered desirable. Here in my recipe only a small amount of brown sugar is on the meat before the cooking begins and it is protected by the resulting steam that will be created by the liquid added under the rack. The steam will make the membrane soft and baste the top of the ribs as it circulates between the meat and the foil...A Dutch oven may be used for a single rack. The membrane can be scored well with a fork just before grilling if you think it looks thick...it will render out while cooking. Some brands of pork have thicker membranes...I just leave it on and it helps keep the meat moist. If you prefer not to bother with the grill then take the foil off and bake for another 15 minutes at 375F...then sauce the ribs if desired and just keep warm until serving...and you may want to add some liquid smoke flavoring to the meat cure or to the rub. Propane gas grills...you may want to add some smoke flavoring to the meat cure or to the rub. Some brands of Pork such as Hormel might have been injected with a salty broth solution in which case you might want to omit the optional salt in the cure. Vinegar...This is not vinegar style and we already used the Tenderquick; but there is some in the hot sauce. Cured ribs do not need an abundance of vinegar. Oregano...Mexican Oregano has a more potent oil and survives the heat. It also tastes more like BBQ compared to Sweet Oregano. Paprika...Spanish Paprika turns bitter and Hungarian Rose is for Seafood. Dried Italian Flat Leaf Parsley....Not the same as cheap dried Parsley flakes. I buy a bunch of fresh then coarse chop it and spread it evenly around on the pizza pan. A few minutes in a warm oven then a few minutes out. Repeat about 4 times and it will be vivid green and crispy. Drying it first activates the aromatic oil which is a key flavor that I desire in the recipe. Adding a dab of mustard to the spicy Tomato Sauce will create the "Piemontesi" flavor aka Piedmont Valley BBQ sauce. Add a dab of Mussleman's Apple Butter, a splash of Wolcester, and a squeeze of lemon to the Piedmont and that's a Memphis. "Barked Ribs" are equally delicious but have a semi crunchy sweet spice topping instead of a wet sauce. *When making several racks of ribs at home then I do not use the sauce and rub until just before grilling because the ribs will be slightly overlapped while baking in the oven then the sauce is cooked unevenly. This recipe can make 3 different famous styles plus your own special touches can be added. Be sure you have Spare Ribs and not Loin back ribs or Baby back ribs. Spare Ribs should not be cooked for more than 4 hours. Thanks for so many good tips on preparing this, plus the mouth-watering photos. A good recipe for anytime, but especially summer BBQ's. Love ribs! I mean, who doesn't! Thanks for sharing! I am not especially fond of ribs, but I tried these and they were DELICIOUS. Truly melt-in-your mouth texture, and perfectly flavorful. 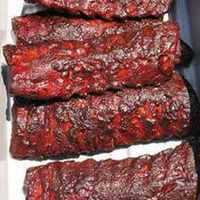 I'm trying to cut back on meat in general from my diet, but I couldn't help but have a second helping of these wonderful tasting ribs....GREAT recipe. Lazy me, I skipped the optional Barked Spice Topping and the final smoking on the grill, and followed the tip you made July 3rd under "Reviews" to finish in the oven. Other than that I followed directions precisely. Company was impressed, and there was hardly a rib leftover. The list of ingredients can appear daunting, but most are just seasonings and condiments. So glad you put your heart and soul into posting this! That is a nice long recipe! Am sure will be wonderful. Thanks for sharing us. Its very easy. Most of the time is spent just waiting for something else to happen.